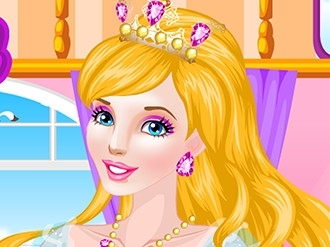 Make Cinderella ready for the ball by doing facial treatments and other makeover processes. At the end of the makeover session, you can make up this charming girl by finding the right hairstyle, outfits, and cosmetics which will entice the prince. Make Cinderella the center of attraction at the ball! 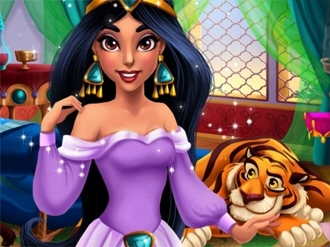 Enter a whole new world of beauty treatments with the elegant princess Jasmine and join her at the Sultan's palace. Apply creams and masks, then head over to the makeup session to give her a complete new look. Once you're done, pick a marvelous outfit for Jasmine to set out on a new adventure. Tiana used to be an ordinary girl and has never dreamed to become a princess, unlike her friend Rosie. While Rosie never skipped an opportunity to talk about herself being married to a prince one day, Tiana’s only ambition was to open her own restaurant to continue her father’s business. But, as it always happens in a good fairy tale, Tiana ended up with both becoming a princess and owning a restaurant! Because kind-hearted, hard-working and patient people are always being rewarded. However, Rosie has also been a good girl all along so she also got what she deserved in the end: she married another prince and became a princess too. Princesses Tiana and Rosie are still close friends and they like to visit each other and spend time in memories about their childhood. Today Tiana is going to see her bff Rosie again. Help Tiana to look flawless as a true princess should. Cinderella decided to change her usual blue-and-white look to something completely different. Will you help her find a new style? But you'll have to take care about her skin first. Poor princess Cinderella! After she's done our all the chores that her stepmother has given her she is left with so little time left for getting herself ready for the ball. Only you could turn her into the ravishing “belle of the ball” now! Work your magic make-up skills on her, then help her pick her dreamlike ball gown and her perfect glass slippers, as well! Belle is my favorite princess of all time. She is both beautiful and smart and she fell in love with the Beast. He is trapped in an awful spell and Belle wants to help him. She has many things to do in order to unlock this terrible spell and join her true love. Start the Belle House Makeover game and make sure the cleaning and decorations are finished in time to save the Beast! The first step is to find five items which are hidden around the room. In Belle House Makeover you have a great palette of color to choose from and you need to be fast, because the Beast in waiting to be saved. Use cheerful colors and patterns to paint the walls, curtain, table and bed. Enjoy playing Belle House Makeover! Life under the sea is different than the one from the above, staying in the water for too long can really damage your skin. Help Ariel get ready for the concert, choosing from a variety of seaweed beauty masks. Then pick the best makeup and outfits and match them perfectly for our young princess!